In the 1990s, Dr. James Harris of BYU, along with Dann Hoane, succeeded in establishing the algorithm for the oldest alphabetical system yet discovered. The team brilliantly assigned sound values based on the pre-Thamudic (early Hebrew and Aramaic) dialects instead of sounds used in Arabic dialects. The results were dramatic. Prior to their discovery it was believed that Southern Arabia held the root language on which the first alphabet was based. This was because the old signs were found in Ethiopia and Yemen. 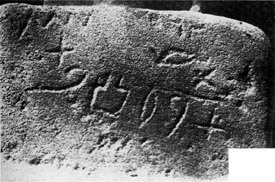 While other similar inscriptions were found in the Sinai, it was thought that these were from people that migrated from the South, and who spoke Arabic. Viewzone's expedition to Yemen in 2001, showed the possibility that the language originated in the Sinai and was brought to Yemen through the marriage of Solomon (King of Israel) and Queen Sheba (Yemen). The Queen's conversion from belief in planetary deities (the Sun and Moon) to the One God would almost require that the pre-Thamudic language of old the Judaic texts should be taught and used as the official tongue. The birth of their child, Menelik, also would have strengthened the reliance on the language of Israel since Menelik subsequently received the responsibility for caring for the Ark of the Covenant when Israel was invaded by the Assyrians. Indeed, many of the texts found at the Queen's palace, dated to the second millennium BC., have been successfully translated using the old Hebrew algorithm and dialect discovered by Harris and Hoane. And many of these texts speak of the union of the Queen with Solomon and the important prophecies given to Menelik by the Lord, EL, supposedly through the Ark. Surprisingly, the same alphabet has also been found, dated and translated in other areas of the globe. Multiple inscriptions are grouped in Southeast Colorado and many more are scattered around the major Oceans and waterways of our planet. This may suggest that the alphabet was indeed the earliest one, based on Egyptian hieroglyphics, and was spread globally by an intelligent sea-faring culture at least 4 millennia ago. What follows is a brief history of the language, including the important contributions made by Harris and Hoane, and which has been copied from an old web site that was accessible just prior to the death of James Harris. Sir William Flinders Petrie (1905) Up to the beginning of this century, the Mesha Stele (Moabite Stone, a royal inscription of a king of Moab named Mesha, ca. 850 BCE) was the earliest known alphabetic inscription. Speculation on the origin of West Semitic alphabets was based largely on the Bible, or traditional attempts to reconstruct the past. In the winter of 1904-1905 Sir Wm. 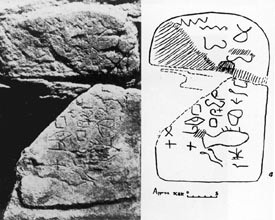 Flinders Petrie discovered the inscriptions at Serabit el-Khadim that became known as Proto-Sinaitic. Petrie reached the conclusion that the inscriptions were alphabetic but made no attempt to identify any related offshoots. An exhibition catalogue was published in 1905 and an expedition report in 1906. A major breakthrough came with the decipherment of the word b'lt, (B'alat) by Sir Alan Gardiner in 1916. Gardiner concluded that the Sinaitic signs were created by reforming Egyptian Hieroglyphic signs based upon their acrophonic value. His reasoning has been found to be sound and his work continues to be the foundation upon which progress advances to the present. His early decipherment's are called the B'alat inscriptions (b`lt). Hubert Grimme stood alone, with modest support from Van den Brenden, in postulating the existence of a pre-Thamudic alphabet, and rejected the notion that Thamudic scripts evolved from the South Arabic script. He was never able to find such a script (possibly because he looked for it in the wrong desert). Had he looked closer to the birthplace of West Semitic scripts he may have recognized "Old Thamudic" (Old Negev) which was the most probable parent of the Arabian scripts. 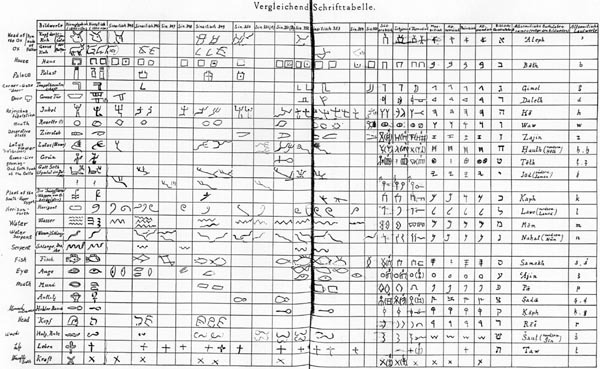 While Grimme's translations may have some serious defects [the same can be said of all translations before and since his time] his sign lists showing the correspondence of Proto-Sinaitic &Proto-Canaanite to Egyptian Hieroglyphic signs is very helpful and was as well done as any others of more recent vintage. 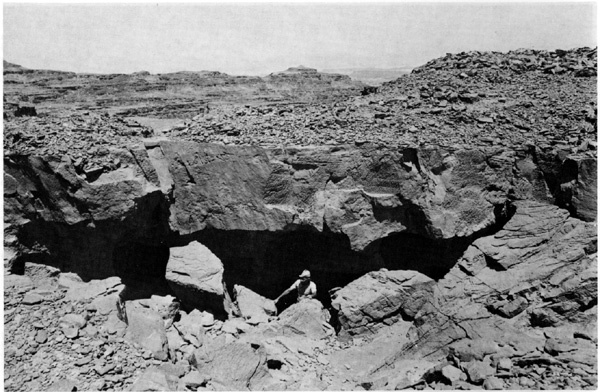 In 1927 a Harvard University Expedition in the Sinai made a side trip upon their return from Santa Catherina through Serabit el-Khadim. They removed some inscriptions left by Petrie and delivered them to the Cairo Museum. They also increased the corpus of Proto-Sinaitic inscriptions by three (Lake, Blake, and Butin 1928). The above effort was a prelude to a much more ambitious and well planned under-taking by Harvard University. From 1930 to 1935 Harvard and the Catholic University of America worked at Serabit el-Khadim and uncovered ten more inscriptions from the area (Butin, New, Lake and Barrois 1932; and Butin, and Starr 1936). It seems possible that during the decades of the thirties through the fifties West Semitic scholars accepted earlier reconstruction's of alphabetic origins as solid facts and assumed that all essential questions had been adequately answered. In the era of this mind set Winnett, of the University of Toronto, attempted to translate what he called, "Thamudic of the Negev."